After expelling several religion-based student groups from campus for “discrimination,” the University of Iowa is being sued for religious discrimination. The University of Iowa chapter of InterVarsity Christian Fellowship/USA was one of the student clubs kicked off campus for not conforming to a university rule that clubs must eliminate a faith-based precondition to serve in leadership. InterVarsity Christian Fellowship consulted the Becket Fund for Religious Liberty, a nonprofit legal group, and sued the university Aug. 6 for violating its First Amendment rights. The group responded by “emphasizing the importance of having Christian leadership” for the Christian club, the lawsuit says, but the school rebuffed it. “The university further stated that InterVarsity student leaders could not even be ‘strongly encouraged’ to agree with InterVarsity’s faith,” according to the suit. The university has disallowed numerous other clubs for the same reason, including Muslim and Sikh groups, it says. The university will not comment under its policy on “pending or ongoing litigation,” Anne Bassett, the school’s media relations director, told The Daily Signal on Wednesday. We’re grateful to have been part of the university community for 25 years, and we think that the university has been a richer place for having Sikh, Muslim, Mormon, Catholic, Jewish, atheist, and Christian groups. Because we love our school, we hope it reconsiders and lets religious groups continue to authentically reflect their religious roots. “How sad that in the name of diversity and pluralism the university would seek to curtail the freedoms that protect true diversity and principled pluralism,” he said. 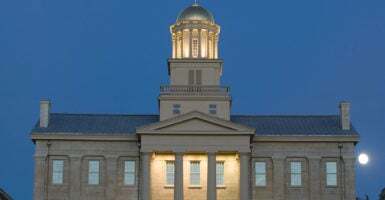 This report has been updated to reflect University of Iowa’s agreement Aug. 13 to allow “deregistered” religious groups to continue on campus while the litigation continues. Jeremiah Poff is a former member of the Young Leaders Program at The Heritage Foundation.